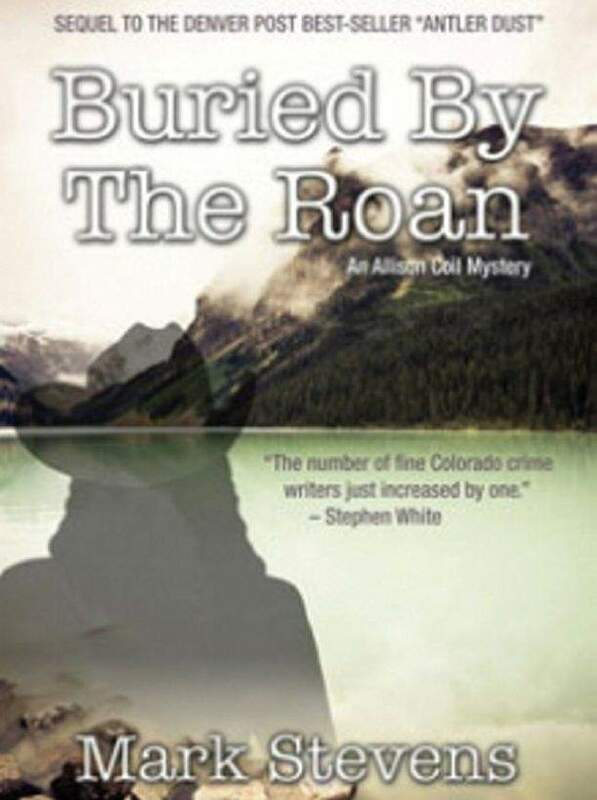 Buried By The Roan is the second novel in the Allison Coil mystery series by Colorado author Mark Stevens. Allison is a tough, attractive woman with great strength of character who was introduced in 2007s Antler Dust. This story is set in the Flat Tops Wilderness, the second largest wilderness area in Colorado located in the northwestern part of the state. It is late fall during elk hunting season and Allison Coil, who owns her own guide business, is leading hunters into the mountains. Allison is an anomaly, a female in a traditionally male role, but after surviving a plane crash at LaGuardia Airport in New York, she decided to change her life and moved west. Allison relishes the mountains, her horses, the wide-open spaces and the peace and quiet. Allisons routine hunting trip soon devolves into a sheriffs convention when one of her clients, Josh Keating, disappears. Another troubling issue is a Rockies ball cap that Allison finds which then vanishes from her saddle. After a fruitless search, Keating is found frozen to death, an apparent accident. Later, Allison learns the cap appears to belong to a man of the wild who is watching. Or is he stalking the intruders who have invaded his territory? Is this a case of the hunters becoming the hunted? Meanwhile, back at the ranch (literally), Allisons best friend Trudy Heath is dealing with upsetting problems of her own. Trudy has also survived a traumatic ordeal, which has given her some notoriety. Now some well-meaning friends want to use her as a spokeswoman for their cause to create local environmental changes. Trudy is far less outgoing than Allison, and the thought of speaking before others gives her chills. Stevens has created a cast of characters that range from appealing to appalling. None are stereotypical but are robustly portrayed. Even the horses have individual personalities. Of particular interest is Devo, a back-to-the-earth devotee who crosses paths with Allison and her hunters. Allison and Trudy are strong female leads who still have secrets to plumb and adventures yet to live in future novels. The Flat Tops are an enticing setting and Stevens provides a rich descriptive narration that puts readers in the saddle on a rugged trail that leads up to rarified heights. Sounds, smells and visual beauty come to life in Stevens accomplished writing. Stevens uses the age-old battle of old-timers vs. new arrivals in town to build tension that adds to the suspense as the story unfolds. Stevens has taken a real environmental issue surrounding the plan to drill for oil and gas on top of the Roan Plateau and used it as a major conflict point in this newest story. The practice of fracking and its effect on groundwater and wildlife also concern environmental groups that soon descend on the area. Wyoming author C. J. Box has built his Joe Pickett series around similar environmental issues and with great success. Although Allison is an amateur sleuth and Pickett is a state game warden and thereby a professional, the action and the plot in Buried By The Roan are equally effective. Once readers have sampled this Allison Coil novel, they will want more. Good western stories dont grow on trees these days, and Stevens provides real entertainment and food for thought about where the New West is heading. Buried by the Roan by Mark Stevens; Peoples Press, fiction, 348 pages softcover, $14.95. Stevens will speak and sign copies of the book at 6:30 p.m. Monday at Marias Bookshop, 960 Main Ave. For more information, call 247-1438 or visit www.mariasbookshop.com.